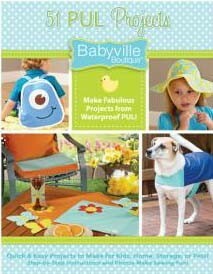 Babyville Boutique is a new & completely coordinated program of products that encompasses all aspects of sewing for babies & toddlers, including the growing interest in diaper making. It is comprised of products that are environmentally friendly, economical & safe for children. Make everything from unique toddler apparel such as a warm and cozy poncho – to pet coats and accessories and many home décor items for the nursery and outdoor living. Our basic instructions section will give you all the tips and techniques for successful sewing. 60 page book with creative ideas – complete instructions – patterns and how-to photos for many useful and fun projects.